ost athletes' glory days are over when they graduate from high school. Mine never made it past sixth grade. I recently received a letter from a cousin with whom I had lost touch decades ago. In it was a folded newspaper clipping of our sixth grade basketball team from 1964. My cousin, Mike Stallins, played center and I was the point guard for Hall Street Elementary School in Madisonville, Kentucky. That's me on the far right wearing number 14. Mike is in the center wearing number 10, as my aunt helpfully annotated with a green ballpoint pen. 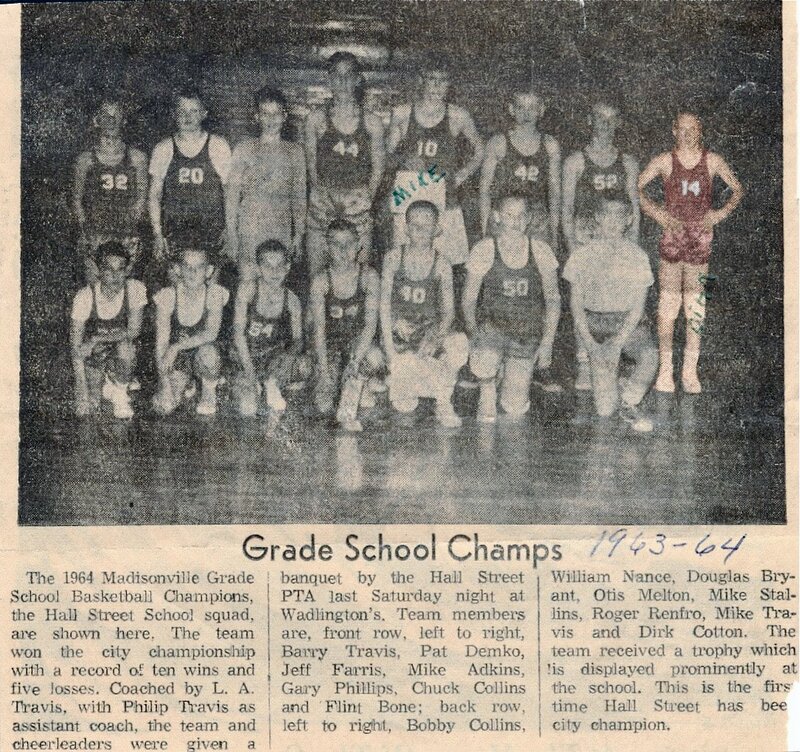 We won Hall Street's first (and I suspect only) city basketball championship that year. It was Hoosiers without Gene Hackman. As you can see from the clipping, we had it all, red satin gym trunks short enough to impress Larry Bird, red cotton jerseys. Heck, we even had cheerleaders and they had uniforms. There were eight teams in our league from Madisonville and a couple of small surrounding communities, Hanson and Anton. Waddell Avenue Elementary (pronounced like "waddle") and West Broadway Elementary had better teams than Hall Street, but Pride Avenue Elementary regularly beat us all. We were at best a fourth place team. The season progressed with few upsets and all eight teams played in the tournament. The remarkable thing about Pride was their backcourt— their guards were the only two black kids in the league. Their mothers came to every game and were the only African-Americans in the stands. I remember how they cheered louder for their kids than any other parents at the game, but more than that I remember how much better players their kids were than just about anyone else. I couldn't appreciate at that age how much courage it must have taken for those two twelve-year olds to play basketball in an all-white league in the South in 1964, or for their parents to sit in the stands and draw attention to themselves and their children. I learned just a few years ago that I had grown up, before moving away after seventh grade, in a small enclave of staunch segregationists in western Kentucky. Most of Kentucky had integrated schools by 1964, but Madisonville and surrounding communities were some of the last holdouts. The owner of the Madisonville Messenger, from which these clippings were taken, argued in editorials that blacks preferred segregation. Pride Elementary, ironically, had been at the center of racial tensions just a few years before. Nearby rural communities Sturgis and Clay had made national headlines a few years earlier by defying integration. I was living in a cauldron of civil rights struggle, but was too young to realize it. Before I go on with my story, I owe it to Kentuckians to point out that theirs is not an unusually racist state. On the contrary, Louisville was among the first large southern cities to integrate its schools and most of the state followed quickly, but according to histories of the area, western Kentucky held communities that did not. According to the Southern Poverty Law Center, Kentucky now has far fewer active hate groups than any other southern or bordering state, or the Midwest. Hate groups were a minority that didn't represent our community or the state then, nor do they now. But, back to my story. We played Waddell Avenue in the semifinals and, although we were underdogs, found ourselves tied with a minute to go. I was fouled and went to the line to shoot a bonus. I was the second leading scorer on our team. My cousin scored more but that was because he was the tallest kid in the league and the referees didn't call lane violations. He stood in the lane beneath the basket and just shot over the defender. I hit nothing but net on both free throws, putting us ahead by two with just seconds remaining. Waddell guards brought the ball down court, but Mike was able to tie up his man and set up a jump ball at mid-court. Waddell called timeout. Our coach furiously laid out a strategy for the last few seconds, but I paid little attention. I just wanted to get back on the court and play ball. I heard him say something about having Mike tap the ball to the far end of the court so Waddell would use up time bringing the ball back up. He told us not to even try to take possession, because we might foul. He wanted us to get back on defense and simply wait for their guards to run the ball down, and hopefully run out the clock. Mike tipped the ball into the opponent's court, just like Coach had told him to do. I ran the ball down, just as Coach had told me not to do, but just as I grabbed it with both hands, a Waddell guard ran into me and I went back to the foul line. I sank both shots, putting the game out of reach. I was one of the last to reach our dressing room and when I walked down the steps, Coach screamed, picked me up and swung me around in the air. My head bumped into Mike Travis' lip as Coach spun me and his lip began to bleed. Mike yelled and dripped blood, but no one seemed to notice. Coach, apparently not confident that we could win the upcoming final against Pride, kept yelling, "We're gonna' get a second place trophy!" We hoped he meant "at least a second place trophy", but that wasn't what he said. My Dad and I walked in total silence through the cold winter evening from the gym to our car, staying close by the streetlights, I, wondering if I had done something good enough to make him proud and he, wondering how to tell me that I had. "Well, you bailed them out of that one, didn't you?" he finally offered. "I guess so", I replied and, fathering being what it was in the sixties in the rural south, that was the last discussion that would ever be on the topic. Truth be known, I remember nothing about the final game against Pride the next evening except the last play. Somehow, we were tied with five seconds left in the game, despite having been clobbered every time we played them in the regular season, and we had the ball. Coach called timeout and frantically drew up a play. I can't tell you what he said now because I didn't listen to him then. Gary Phillips in-bounded the ball to me, I dribbled to the free throw line and saw my cousin, Mike, inexplicably standing alone under the basket. I remember throwing him a bounce pass to avoid the defenders between us, he turned to shoot and I saw the ball drop through the net as the horn sounded. After a frantic celebration that none of us even remotely expected, the All Tournament Team was announced. I was a shoo-in. I was the second leading scorer on our team and my pressure free throws had clinched the semifinal game. I had an assist on the game-winning basket in the final. My cousin's name was announced and then Gary Phillips' was announced. I sat on the floor waiting to hear my name long after the list was completed and the crowd had headed for the exits. So long, glory days. It was an experience I would relive several times throughout my business career. Sometimes in life, you "bring home the bacon" and someone else gets to eat it. It's just harder to take when you're twelve. On the way back to the car in the cold and dark, I said nothing. "What's wrong?" my Dad asked. "You won the tournament. Aren't you happy about that?" "Yeah," I answered, without convincing either of us. "Are you upset that you didn't make that All-Tournament Team? That's just a damned popularity contest. That's all it is." I loved the contempt in his voice. As I stared at the yellowed clipping my cousin had mailed me, I was reminded of a special time in my life when youth allowed me to enjoy playing basketball unhindered by the knowledge that we weren't actually good enough to win a championship and oblivious to society's imperfections, even as they stared me in the face. I eventually turned the clipping over and noticed what was on the back. Amazingly, it was a nearly complete editorial cartoon that showed a Civil Rights Bill floating in a "sea of politics" with only the top half of the caption, "At the Mercy of the Currents" spared by the scissors. The Civil Rights Act of 1964 was signed by President Lyndon Johnson in July, a few months after Hall Street Elementary's City Championship. From Locally Groan, by Dirk Cotton, LuLu Publishing, 2010.
fantastic. thanks for writing it.